Having just returned home from a long weekend at Death Valley National Park, I have to say that it’s nothing short of awesome. Whether you’re a geologist who wants to be stumped or a tourist looking to escape from the ordinary, Death Valley offers something for everyone. I wasn’t as excited as I should have been to visit at first, but now that we’re home I find myself wanting for dry desert air and tranquility that Los Angeles simply cannot provide. I highly recommend you consider seeing it for yourself. One of the more popular attractions in Death Valley is Scotty’s Castle, which is sometimes referred to as the Hearst Castle of the desert. 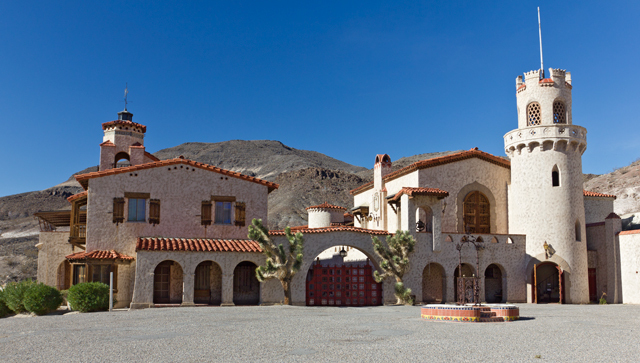 Formally called Death Valley Ranch, Scotty’s Castle got its name from one of Death Valley’s most famous inhabitants, Walter Scott —a con man of sorts. You can read more about the story here. Scotty’s Castle was built in a Mission Revival/Spanish Colonial Revival architectural style, which I’ve long been a fan of. Although, I usually lump the general style into what I call “Mediterranean looking homes.” My girlfriend, on the other hand, is not as much of a fan of this style. However, after visiting Scotty’s Castle, we finally agreed that it would make a superb looking home. 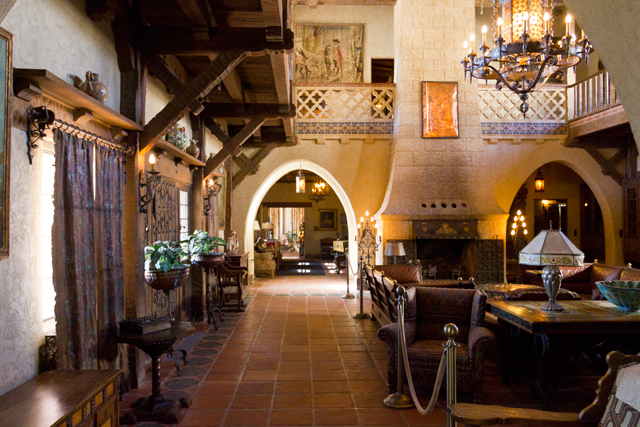 While my future home likely won’t be as grand as Scotty’s Castle, there are a number of important elements inherent to any Mission Revival/Spanish Colonial style home: white plaster or stucco walls, exposed wooden beams, red clay roofs, iron trim, decorative terracotta floor tiles, and a relatively open floor plan. The furnishings in a Mission Revival home are equally as important as the architecture. The furniture should be predominantly made of solid wood, complimented with rich, earth-colored fabrics. And since tile floors and stucco walls can be a bit cold on there own, you’ll want to use decorative rugs and heavy fabric window treatments to add some much needed warmth. In the bedroom, a wooden or wrought iron bedframe works best, and plush bedding helps soften the sharp lines of the bed. Iron wall sconces and floor lamps are also a great way to enhance the look of your Mission Revival home while adding some much needed light. To me, you can’t go wrong erring towards more gothic/medieval style lighting options that look like they came out of an old European castle. To really tie the whole look together, think about sticking with a consistent theme throughout the home. 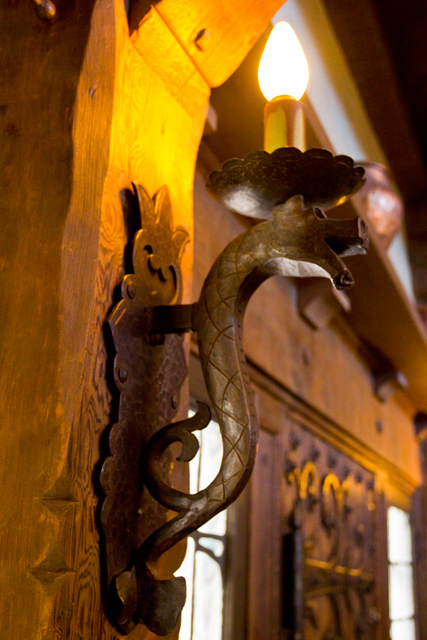 For example, all of the iron trimming in Scotty’s Castle featured a dragon; a relatively small detail that really stood out once noticed. Since the possibilities of designing your own Mission Revival home are endless, the best way to perfect the look in your own home is to see what other designers have done. Houzz has an excellent gallery of Mission Revival homes to admire. What’s your favorite architectural style? Did I miss any important elements of Mission Revival? Share your thoughts in the comments below. As a young teen, I was often invited to traditional Italian Sunday dinner at my friend Juliet’s house. Aunts and grandmas began cooking several days prior. Mouth-watering aromas rising up from the basement kitchen became more dense and elaborate as the weekend neared. Courses were numerous and staggering – salad course, soup course, pasta course, meat course – a three hour food extravaganza. Desserts were surprisingly humble. Some fresh fruit and nuts, maybe spicy homemade wine or a bottle of stinging grappa. On one such occasion, Julie’s grandmother decided to ramp it up. 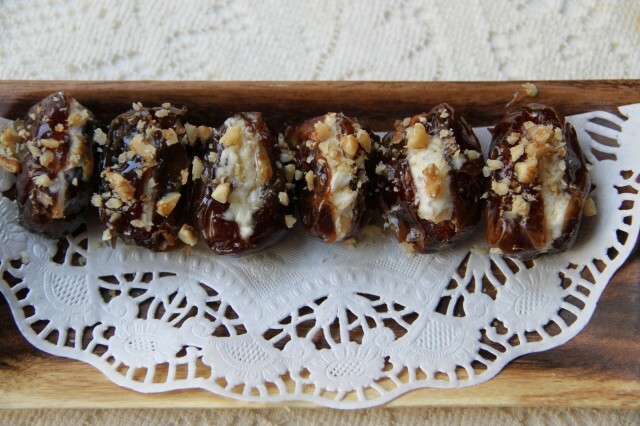 With a small paring knife, she deftly pitted several dates. 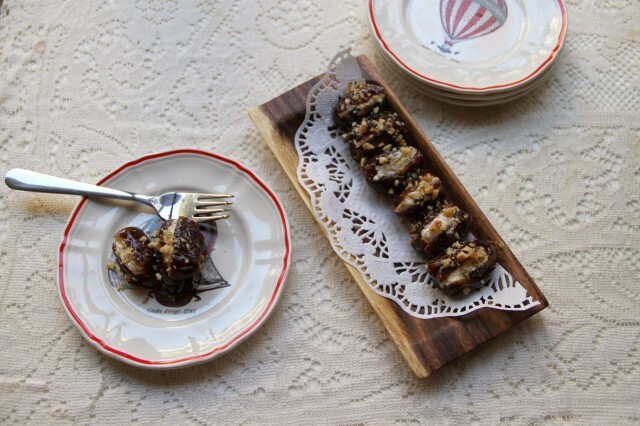 Each one was quickly stuffed with a walnut half, then rolled in granulated sugar to a shimmery sparkle. She saw the hesitancy in my eyes, and urged me to try one. Wow! One amazing bite of sweet-on-sweet, soft-on-crunch, nothing-much-but-nature and I was hooked for good. Here, cream cheese is added for depth and texture, and liquid gold honey replaces the sugar to keep the tender dates moist and juicy. With only four ingredients and a small investment in time, you may also be saying “wow” to this humble, remarkable, not-just-for-Sunday breakfast in bed. Slice dates lengthwise on one side and remove pits. In a small bowl, mix together cream cheese and 1 tablespoon chopped walnuts. 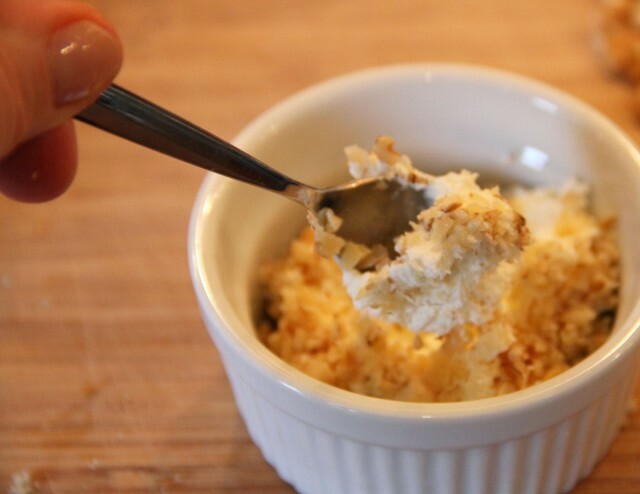 Fill dates with cream cheese mixture using a small spoon. Wipe off any excess on outsides of dates. 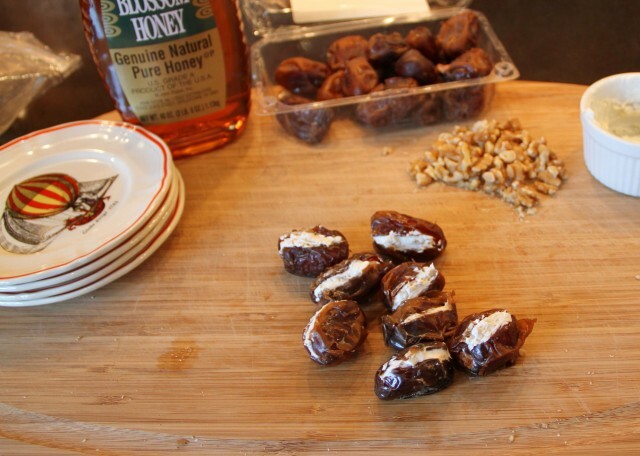 Dip each date into honey to cover completely and set aside. Pour remaining honey into small, heavy pan, and heat on low. Place dates in heated honey, and continue to warm on low heat, about 5 minutes. Dates should be warm, and cream cheese will be slightly melted. Transfer dates to a small serving plate, and garnish with remaining chopped walnuts. Honeyed dates may be served either warm or at room temperature. These are my very grumpy thoughts as I try to will myself from my bed over to the computer. Just then, I hear my neighbor getting out of his bed on the other side of the wall (yes, quarters are THAT close) and I suddenly realize that the rooster noise was coming from his place. It occurs to me that what I was hearing was not a live animal, but rather an app on my neighbor’s phone. Damn. I guess you can take the guy out of Nebraska, but you can’t take Nebraska out of the guy. 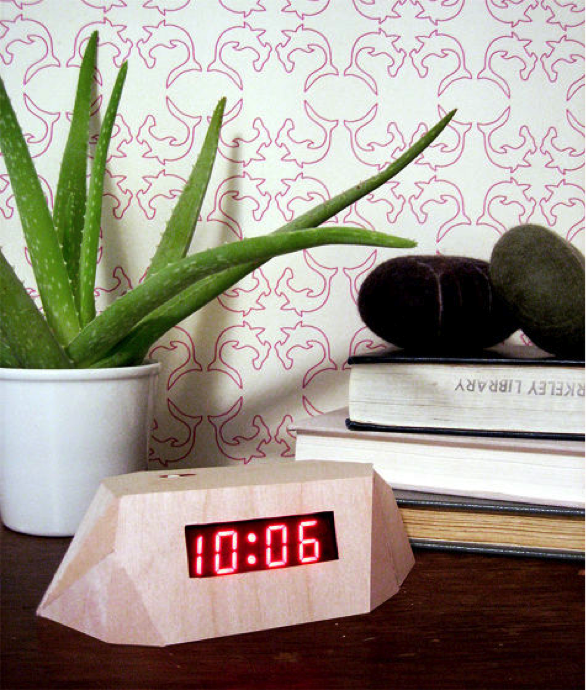 This is the DIY faceted wood alarm clock from Design*Sponge. Use it to creatively cover up your conventional digital alarm clock. As I am geometrically challenged, the plans are too complicated for me, but I’m sure you can handle it. While traveling in Alaska many years ago, my dad asked for a wake-up call at a hotel. They handed him a clock with ringer bells. Here’s a new version of this classic. White on white. Ghost love. I want all of these! 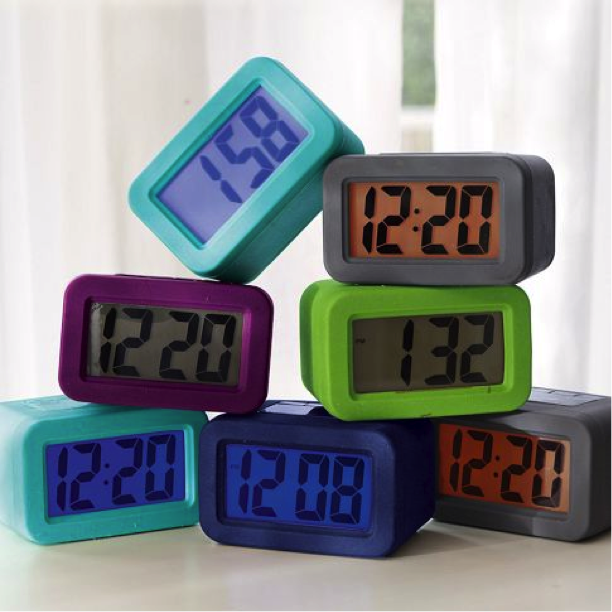 These inexpensive silicone encased clocks can add that much needed punch of color to any room. 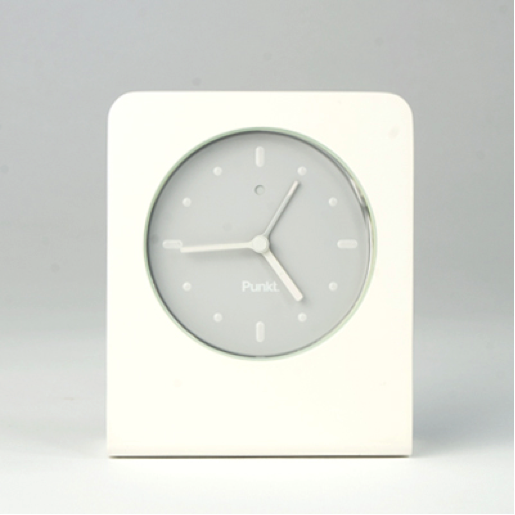 I appreciate the sleek and simple design of this analog clock. 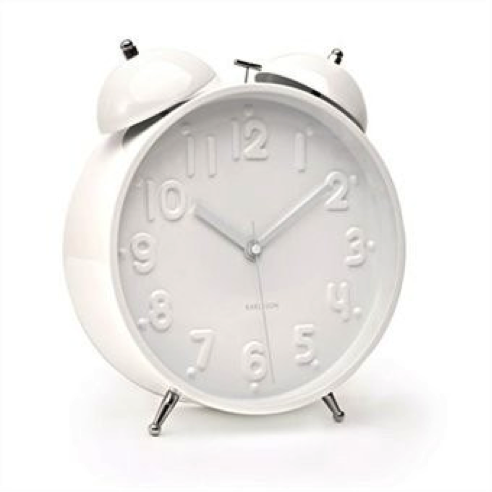 It would look right at home in your modern bedroom and it is battery operated, so you don’t have to worry about pesky electricity. 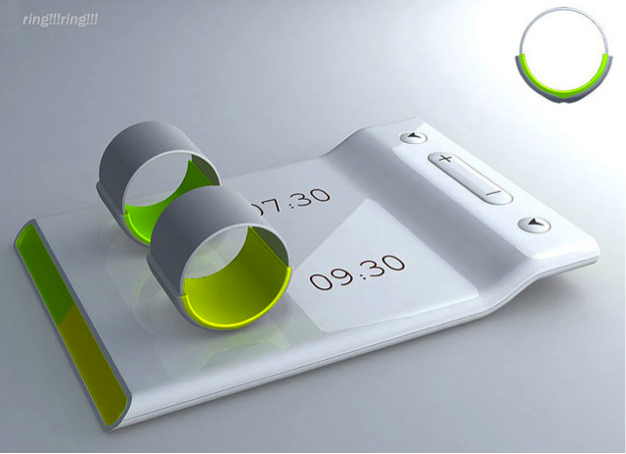 And for something a little different… a futuristic alarm clock you can wear! 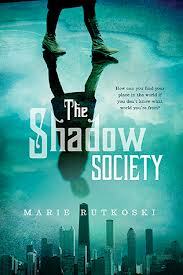 The Shadow Society by Marie Rutkoski. Nothing in Darcy Jones’s life has ever been simple. Or normal. Or stable. Left outside of a Chicago firehouse at an early age, she has been in and out of foster homes for most of her life, and her earliest years are a complete blank. She has alway chosen to leave the past forgotten, but when a mysterious boy shows up at her high school, she suddenly finds herself wondering about who she is, who she was, and why this young man seems to be the key to understanding it all. When this mysterious young man, with whom she has been working on an English project, slaps strange flame-filled cuffs on her and calls her “Shade” I think Darcy realizes that she is about to learn a whole lot about herself. And when she manages to vanish into thin air and flee her captor, I think she realizes that what she learns will be pretty darn interesting. This is the first novel by Marie Rutkoski outside of her Petra Kronos trilogy, whose third installment was released about a year ago. It is a much more complex novel than the Petra Kronos books, partly because it seems less evocative of other teen fantasy novels, partly because the main character is older, more damaged, less sure of what to do. It’s not the most incredible book ever written; nevertheless, I had a hard time putting it down at night. Hello dear readers! Here we are again with another live-blog of a festive holiday special. Touching, topical, and tear-jerking, (at least I think it’s supposed to be) “Fat Albert’s Christmas Special” is here to teach us all the true meaning of the Christmas. Let’s begin! 0:01 – A luminous, star shines above the ghetto, inspiring all to raise up their… Oh, wait. It’s just the star on a Christmas tree. Silly me. Anyhow, we are now panning across a dilapidated cartoon landscape, witnessing the effects poverty has wrought upon a snow-covered, pudding pop-less world. FUN! 1:04 – Fat Albert is worried, folks. He needs to, “get this nativity scene down cold.” Words I never thought I’d ever write… Apparently, the Christmas pageant is in need of the tightest, most funkdafied manger you have ever seen. 1:25 – This cartoon has a laugh track. Glad to know half my work here is already done. 1:35 – Now the whole gang is getting into costume. So much zaniness abounds! A Christmas angel in high-tops? A wise man in a muumuu? What’ll they think of next!? 3:00 – Uh oh, a grumpy old man with a cane is at the clubhouse door! Looks like someone is in need of some holiday cheer and a tired, clichéd story arc involving redemption of the soul. Ho ho ho. 4:19 – Jeez, now there’s a kid at the door, suffering from the sniffles, clothes with too many earth tones, and a society that refuses to acknowledge the plight of the lower class. He’s whining cause his parents’ car is broken down, his mother is pregnant, and… oh… I’m seeing where this plotline is going. 6:52 – Remember that old man? He wants to destroy the clubhouse! 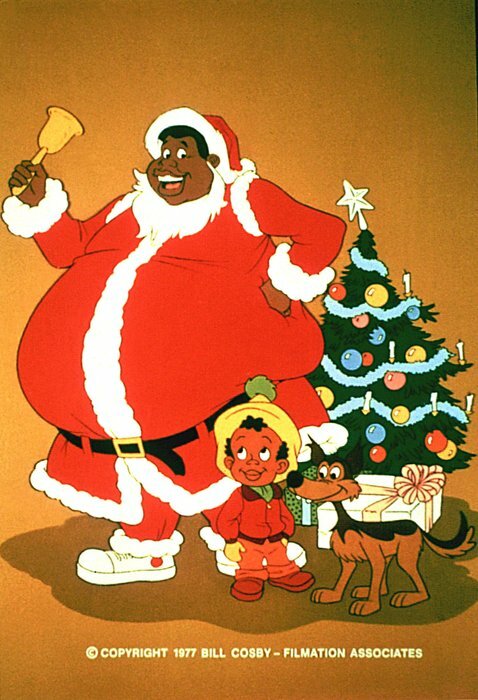 Fat Albert is trying to explain that the clubhouse is necessary because, at the moment, a pregnant woman resides within. Seriously? She has NOWHERE else to go? I mean, I get what the whole point of this in the context of teaching Christmas lessons, but that’s not really a valid argument unless Mushmouth happens to be a midwife. 8:30 – The pregnant woman’s family is at the hospital, finding themselves rejected by the cold finger of bureaucracy. If they had done their research, they would know that all thinly-veiled-metaphors-for-the-birth-of-the-savior pregnancies are handled by the city hospital. 10:38 – Albert’s in a Santa suit, working for the old man’s discount store. His friends are accusing him of selling out, but in reality he is sneakily being taken advantage of by a grieving widower who has lost his ability to relate to a world that chooses to celebrate life rather than wallow in the pain of death. Will he ever learn THE TRUE MEANING OF CHRISTMAS? There’s some seriously deep circle of life stuff happening here, folks. 15:16 – Albert has just asked the visibly pregnant woman without a baby whether or not she has had said baby yet. Methinks it’s time to start collecting pudding pop box tops for education. 16:04 – So, the father has just realized Sniffles is missing. He reacts by opening up the clubhouse door, taking a gander at the dangerous urban blight his son is lost in, and then closing the door with nary a word. At this point, even I’m ready to call Child Protective Services. 17:54 – Fat Albert and friends have taken it upon themselves to search for Sniffles. Fearing for his life (would you want to be returned to such neglectful guardians?) he chooses to run onto an icy river in an attempt at recreating Virginia Woolf’s final moments. 18:55 – The gang returns to the clubhouse, Sniffles-less. The baby is born, everyone is smiling, and no one seems to care anymore that the other kid is missing. Out with the old, in with the… Who’s at the door?? 19:25 – The old man back! And he has Sniffles! Thank the lord, another child has not been lost emulating the tragic death of a famous literary figure! 20:30 – Realizing the potential PR nightmare he has on his hands, the old man decides to spare the clubhouse! Hooray! Now everyone is giving one another gifts that have materialized out of thin air. Following suit, the old man reaches in his pocket, pulls out a baseball (he obviously does not wear skinny jeans), and gives it to Sniffles. 21:50 – In response, the credits begin. And that’s the end, folks! What did YOU learn about Christmas? Did you get it down cold?